The main focus of any retail professional's job is to improve the commercial performance of the retail store by maximizing profitability. Retail professionals have to achieve performance objectives with much dedication and will require experience in one of the main areas of retail activity: store operations, human resources, finance, customer care, etc. What is needed the most for securing a job in this industry is the ability to sell oneself to your prospective employer. One needs to showcase convincing skills to the retail employer to get oneself a job. Preferred Resumes provides masterfully crafted resumes that cater to a wide variety of employers and can literally convince your prospective employer that your skills and attributes are what they need. Thousands of job seekers rely on our resume services because we are far ahead of others in the industry. Our clients—even those searching for extremely competitive jobs—consistently meet with success. 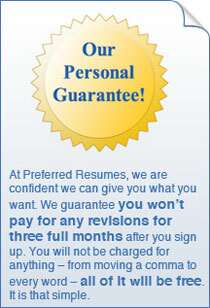 Preferred Resumes has a team of professional retail resume experts who excel in what they do. They have consistently helped thousands of retail managers, sales executives, marketing professionals, operations professionals, and manufacturing managers to land their dream jobs by having exceptional resumes and cover letters. Our writers tailor retail resumes and cover letters according to the unique requirements of each and every job seeker. Those job seekers aspiring for various retail jobs can have their resumes drafted to their specific needs. Even an experienced professional can get a retail resume which showcases his or her marketing experience and distinguishing traits. Our writers also excel at writing exceptional retail cover letters, which play an important role in your resumes being noticed by employers. You will receive the first drafts of your documents within five business days of signing up for our services! You can also use the resume critique option to get a detailed and comprehensive review of your retail resume and improve the same accordingly. Remember, your resume is your calling card for the retail industry. It is your way to get in the door for that all-important first interview. You get only one chance to grab someone's attention, so get started now with Preferred Resumes to add that "extra" to your ordinary resume!